How did you first meet the Amish, and how did you gain their trust? I first met the Amish while selling books, 80 hours per week, in rural Illinois. I happened to bump into a settlement of Amish families and, originally planning to skip these prospects (I was selling, among other books, college prep materials at the time), nonetheless one day decided to give them a try. I found a good response to my younger children’s books, and especially the company’s Bible products, so I decided to continue. As I got a chance to see Amish society from the inside out, I became fascinated with the culture and people. Selling in Amish communities, you get to know a good bit about the Amish from the inside out. A little slice of what their lives are like—what they do, what they care about, everyday-life things like what they eat, and so on. I sold a set of books called the Family Bible Library, and so I was talking to families and learning about why it was important that their children learn about the Bible and Christianity. It was pretty revealing, and you got to know more about what Amish really care about. I grew to respect them and their values. Direct sales is really capitalism at its most raw. And I feel it’s in that type of environment you can really learn a lot. Over thousands of sales presentations, you learn human nature. Trust is a big issue. The Southwestern Company, whose products I sold, has been around since the 1850s and is already known to a number of book buyers, which helps to a degree. But when someone you’ve never seen before, from halfway across the country, after a 20-minute presentation asks for a check for hundreds of dollars for a product to be delivered in three months, that reputation only goes so far. You really have to learn how to establish trust. You also have to determine whether your product might be a good fit for that particular prospect, and if not, to know when to move onward and save yourself and the other person time. Yet at peak times I was having 8-12 people a day writing these checks out to me as an independent contractor, a person from a totally different culture, based on that trust level established. One way I think I was able to gain trust as a stranger was by respecting Amish ways and respecting their time. From a sales standpoint this meant never being pushy. In response to that, I developed a new way of closing sales, which I used fairly frequently—basically totally removing myself from the situation, and letting prospects decide without me in the room, which in some ways goes against what salespeople are taught, by giving up control of the situation. It was an extremely low pressure and very enjoyable way to do sales, and it got a good response. It also helped me understand a few truths about human nature, and I found that the saying that people love to buy and hate to be sold applies everywhere, across cultures. And Amish appreciated this low-pressure approach as well—at least that is what they told me. One’s reputation travels pretty quickly in Amish communities. I found the adage, as one Amish friend puts it, that there are three lightning quick means of communication—telephone, television, and tele-Amish—to be true. Word gets around and if you treat people well, others will learn about it quickly in Amish communities. The opposite is true as well. Though I found it varied from community to community, once you get past the at-times gruff exterior, generally Amish people are friendly and welcoming, exhibiting a traditional rural hospitality, even to outsiders, and I tried to respect that. Also, testimonials from other Amish I’d met, or who knew of or already had my product, helped a lot to build bonds of trust in a short time. 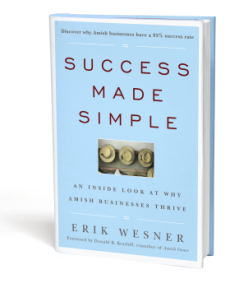 Download the rest of this Q-and-A here, in which Erik discusses Amish women in business, the challenges of living in an Amish home, and takeaway ideas for non-Amish businesspeople.